As the web transitions from text and images toward interactive videos, South Korea’s two flagship internet technology companies Naver and Kakao are eyeing a future in the video platform business. According to a recent forecast from Cisco, by 2020 around 82 percent of consumer internet traffic will be generated by videos, while total global internet traffic will grow annually by 22 percent from 2015 to 2020. With video slated to dominate the web, Naver and Kakao have been moving to streamline and strengthen their video platform services to secure more online users at home and abroad. 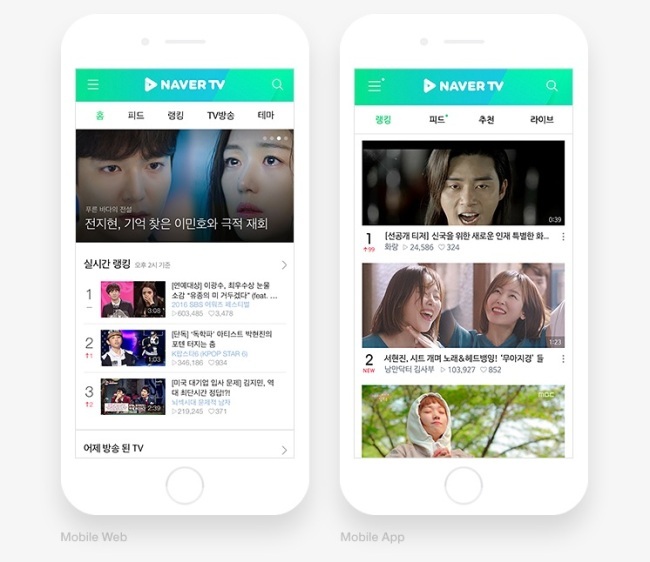 Naver, the operator of Korea’s largest portal website, recently introduced Naver TV, which combines the services of Naver TV Cast — which offers online video clips of popular TV shows and media content — and the high-resolution video player app Naver Media Player. The new Naver TV lets users enjoy high-resolution online videos on both PC and mobile settings and more conveniently access videos on smartphones, the company said. It also offers more customizable features pioneered by early video streaming platforms like YouTube -- such as by allowing users to subscribe to their favorite channels and receive new video upload alerts. Naver TV presents a wider variety of category-based content exclusively available through the video platform as well. “We decided to expand our Naver TV platform so that users on both PCs and mobile devices can enjoy diverse video contents through Naver according to their needs,” said Kim Tae-ok, who leads Naver’s Naver TV team. Another major video platform operated by Naver is its real-time broadcasting app V Live, which lets K-pop stars interact with fans through live broadcasts. The app has recently adopted new technologies and video formats such as video filters and dual-screen functions to grant users a more interactive viewing experience. Looking ahead, Naver is set to continue driving up its capabilities in the video platform business. Its incoming CEO Han Seong-sook has pledged to invest more than 500 billion won ($440 million) toward the local contents and technology sector over the next five years. The Korean IT giant has also formed an investment fund of 50 billion won in conjunction with Softbank Ventures Korea to nurture promising startups in the media contents business — including those that host or possess standout technologies related to mobile live streaming services, media delivery services and video content. At the same time, Kakao, operator of Korea’s top mobile messenger KakaoTalk and portal website Daum, is also quickly moving to capture mobile users who are increasingly watching videos on their smartphones. Kakao has recently rolled out a new version of Kakao TV, which has combined its own mobile-optimized video streaming service with Daum’s on-demand video platform Daum TV Pot. Like Naver TV, Kakao’s video platform strives to combine its video viewing services under a single platform that runs smoothly under both mobile and PC settings. A standout feature of Kakao TV is its ability to sync with the widely used mobile messenger KakaoTalk. KakaoTalk users can watch videos directly via the app, as well as receive video recommendations from Plus Friend corporate channels they have subscribed to via the messenger. 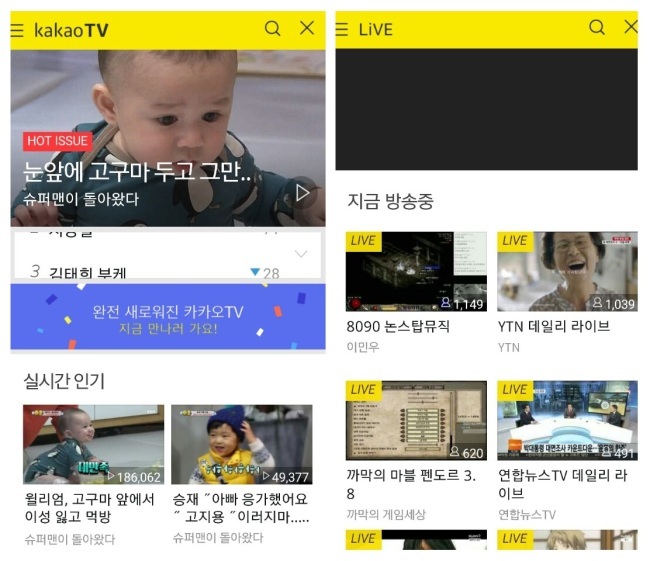 Kakao TV also offers an all-in-one video management feature called Video Station that lets creators manage their videos from production and circulation to user interaction. Its Biz Station allows creators to manage the monetary aspects of their video-making activities. “The newly revamped Kakao TV will become a highly competitive video platform with strong capabilities in terms of video enjoyment, production, circulation, management and monetization,” said director of Kakao’s video platform team Bae Dong-ho.